Sign up!! Arden bunching flowers with a volunteer. 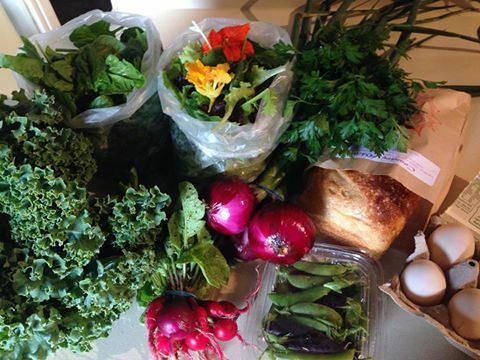 Joining the CSA can bring you a step closer to the farm. Community Supported Agriculture is a way that people have supported their local farms and stocked their kitchens with fresh produce for decades. Community members sign up to receive a weekly share of farm produce and this money helps the farm cover early season costs like seed, tools, and pots. Lots of small farms have CSA programs, and they come in all shapes and sizes. Our program is a traditional weekly share of vegetables for 24 weeks and you can choose to add on freshly baked bread as well! Now we are offering options from other farms we trust. Nope. In fact, an early signup helps us sustain our farm during the slow winter months, and may help you to get a jump start with monthly payments. Does the produce have chemicals on it? No! We do not use ANY synthetic chemicals in any part of the growing process. Our main input in our garden is compost from Royal Oak Farms in Evington. We also use an organic fish fertilizer, feathermeal, and neem oil as a pest deterrent, but mainly we practice an exclusion method for pests, meaning we grow crops under row cover which keeps the insects off! We have 2 pick up locations this year, plus home delivery, all on Wednesdays. You can pick up either at our Farm Stand in Forest or in Lynchburg near Randolph College. The Forest pick up is more flexible, Wednesday from 3-6 pm, and the Lynchburg pick-up is Wednesday from 4:30-5:30 pm. For Lynchburg pickup only, there is also a $5/week delivery option if you forget or can’t make it. Yes, except for a break on August 7, plus a week of your choosing (the share runs 25 weeks and you only pay for 24). Please notify us a minimum of 2 days before pick-up on the week that you want off, and we will not prepare your share. If you do not take a week off during the season, your share will simply end one week early. There is no break for the egg and chicken shares, which start two weeks after the veggie season. What if I can’t pick up my share one week? A summer vegetable share with kohlrabi, zucchini, swiss chard, lettuce, radishes, arugula, scallions, and basil. What is in the share? Do I get to choose what I get? There is often a choice between certain vegetables, but it is on a first-come-first-serve basis. We will send an email to notify you of the share contents in advance. There will only be one type of bread offered in a week. What if I decide to end my CSA membership early? No worries. If you have to end your membership early for any reason, we will refund you in full for the future shares you won’t be receiving. Can I host a pick-up site? Yes! If you want to host a pickup site at your home or another location, please email us and we can talk further. Mutual Benefits and Shared Risk: In addition to a heavy bag of our produce every week, members gain cooking inspiration, updates on our garden, and a sense of community by participating in our CSA program. Members are also entitled to a 10% discount from our farmers market stand for the entire 2019 growing season (but please remind us… we often forget until its too late!) and are welcome to schedule their own tour at the farm any time during the season. The mutual benefit comes as we form a network of supply and demand for local agriculture and together share the risks that small-scale farming can entail. In a season of severe drought or storms the farm may not supply a full share every week, but as long as things go as planned, we will supply you above and beyond what you pay for! Please note that the CSA is not for everyone. Some people join the CSA with good intentions, only to find out that they are too busy to cook the vegetables they receive every week, or they are uncomfortable with the changes and unpredictability of what comes in the bag. The earliest we are able to notify members of what will be in the bag that day is the morning of pick-up, when we send an email reminder. Please do not hesitate to contact us with questions if you are thinking about signing up but aren’t sure if it will suit your lifestyle and personality. The CSA program does require you to commit to eating locally, which sometimes means you lose conveniences that the grocery store offers. On the other hand, many of our customers enjoy the surprise factor and not having to make decisions about what to buy. If you sign up and later find out the CSA does not fit your needs, we will give you a full refund for shares not yet delivered.